A midmorning attic fire forced breakfast customers and staffers out of a Denny's restaurant Monday and caused an estimated $15,000 worth of damage. 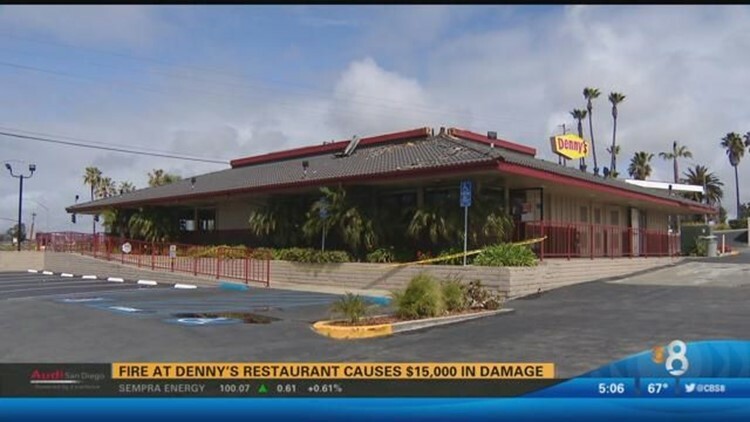 OCEANSIDE (CNS) - A midmorning attic fire forced breakfast customers and staffers out of a Denny's restaurant Monday and caused an estimated $15,000 worth of damage. The blaze at the eatery in the 400 block of Harbor Drive in Oceanside erupted shortly after 8 a.m., according to city fire department officials. Crews had the flames under control within about 20 minutes, Battalion Chief Greg DeAvila said. No injuries were reported. Authorities set the monetary losses at $10,000 to the structure and $5,000 to contents. The cause of the fire was under investigation. A damaged electrical outlet near its origin point may have been a factor, DeAvila said.